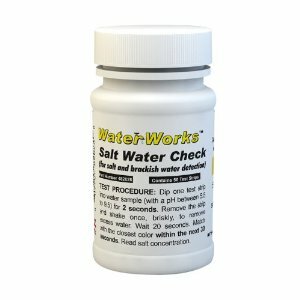 Salt Water Test is designed for easy dip-and-read test to determine concentration of salt in water. 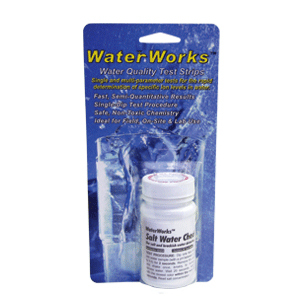 It is a low cost alternative to conductivity meters and wet chemical tests. Detecting concentration of 25%, 50%, 75% , 100% and 150% and various conductivity measurements ranging from 0.2 to 8 (x104 :S/cm). Testing is done using test strips with a reagent that reacts with salt in water. Detection Levels: concentration of 25%, 50%, 75% , 100% and 150% and Conductivity Measurements 0.2, 1.3, 2.7, 4.0, 5.3, 6.6 and 8 (x104 :S/cm).